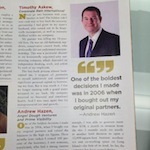 Andrew Hazen is an Internet entrepreneur turned angel investor who founded Angel Dough Ventures. In 2011, Andrew’s company, Prime Visibility, was acquired for $36 million in cash. Andrew has done well for himself, and I want to share an interesting tidbit I learned when reading an interview he did for New York Enterprise Report magazine. I reached out to Andrew, and I was able to learn a bit more about the domain name and its history. The domain name was acquired via Sedo’s Great Domains auction. The domain name fit perfectly within Hazen’s network of 50+/- coupon related websites. Although the site is no longer generating $50,000 a month, I am told it generated between $35,000 – $56,000 a month for 6-8 months. That’s quite a significant ROI! According to a Whois search, Hazen Holdings LLC still owns the Coupons.info domain name, and you can see it’s still up and running, although this line of business doesn’t seem to be one of Hazen’s primary focal points these days. Just shows what can be done with nearly any domain name if the work is put in. I’m curious if the site’s decline in revenue was due to a shift in the industry or due to his focused being shifted? I really enjoyed reading this, it is articles like this that keeps the rest of us going and going! Thanks soo much for sharing, I never knew this. It’s 50K in a revenue….not profit. It doesn’t say what his costs were on advertising and other expenses. Who said it was profit? You sort of did with that statement. Good point, but I assume he did well. Thanks Steven – you are right, I did have expenses to run the TV spots, but even when I was bringing in $50K+ a month, my expenses never exceeded $18k so I was still making PLENTY of profit! Essentially, you have to spend money to make money. Even if you own great domains, you must capture the right market. We see great domains perform poorly. As for Coupons.info, it is one of those high demand niches where people have a need. They want information, printable coupons, and etc. I’m sure BlackFriday.info is making a bundle during the months leading up to Black Friday. Payday loans involve many scams online. The website PaydayLoans.info is a good website that is trying to help those in need of the right information. A lawyer or lawyers dot info domain is also a potential cash cow. Dot info domains make great websites. I see that you use multiple domains and spend marketing dollars to generate the $50K per month. Good job on making Coupons dot info into a profitable domain. It should be noted that Andrew stated on the interview that the $56k revenue came from the entire coupon sites network (30-40 websites), not just the domain Coupons.info. The domain itself only has 3 indexed pages. It’s basically a landing page to collect emails and market to the audience later. It is only a site with lots of landing pages like Parking. There is a lot of money spend on advertising by him. Guerrilla marketing, black/white SEO tactics. coupon.info should piggy back on the site traffic. During the 6 to 8 months Andrew speaks of, COUPON.INFO was parked at NameDrive. By the way Andrew, be nice to share stats with each other. I suspect we might both learn something new. Elliot knows how to contact me if you are interested. Thanks! Love it! Always been a big fan of Andrew’s, also shows how you don’t need the perfect exact-match domain either. Some of his coupon sites are things like AllPizzaCoupons.com and AllJuiceCoupons.com. Thanks for sharing Elliot and huge congrats to Andrew who shows that while the domain is important, it’s the business, and more importantly the leader of the business that counts. thanks Morgan – appreciate your feedback and kind words!! And you’re right, the domain is a strong component of success BUT it’s not the only thing and great business acumen can take you A LOT further! For those who think it cost a tremendous amount of $$ to run the tv ads; think again, especially when you know how to media right (GRIN)! Keep up the great work yourself Morgan, I am a big fan and CANNOT wait for your new business to disrupt the marketplace!! If you made money and did well, congrats! I’m confused how you spent 18K on advertising and claim to have made a nice monthly profit but your no longer doing those monthly numbers? From my experience with coupons, you loose money on the initial conversion and the profit shows when you factor the lifetime value of the customer on subsequent purchases. There has to be more to it than you bought the site, SEO’ed it, spent money on advertising and boom made a killing but now your not. 2 plus 2 is not adding up. The revenue was ALL from Google Adwords -that’s it! Each ‘click’ I got paid! It was ALL Google AdWords revenue – no need to negotiate commissions, etc. Each site had three different positions of Google AdWOrds and I got paid each everytime those ads were clicked. There was NO day to day. I bought air time on the first day of each month and that was it. Yes, the other 50+ sites were optimized but that was done years ago and not within the past two years when the revenue came in!!! Adwords makes a lot of people/companies money, Google included. It takes knowledge, guts, money, luck and knowing people to make money IMO. Why has revenue likely dropped? The coupon craze has dropped. Not at all. For once, people are exhibiting critical thinking instead of believing what they read online. Kudos to the readers. @Andrew. Why did you really stop it? Once it’s setup, couldn’t it be left running by itself? Great Passive income for charity. Or was it because its not really adding value to the internet, not something to be proud off. As you weren’t really offering coupons, basically you were getting people using your business smarts to head to your website and click on the adsense adverts, that are coupon related. The process worked which as an entrepreneur yourself, that was what your more interested in than the actual money making side of it as your already a millionaire? Just my thoughts. Not trying to offend you, or did google tell you to stop or cancel your adsense account? From fraud adsense clicking. Just trying to suss it out.